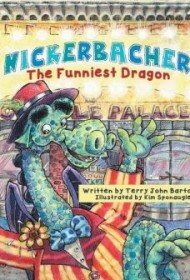 Author Terry John Barto delivers another charming picture book that celebrates big dreams and demonstrates the importance of following your heart in Nickerbacher, the Funniest Dragon. Nickerbacher is a young dragon who is destined to do what all dragons do: guard a princess. But Nickerbacher has bigger dreams than standing outside a princess’s tower, awaiting the inevitable battle with the prince who will come to rescue her. Nickerbacher’s sense of comedic timing is stronger than his desire to breathe fire. He spends his days practicing his comedy chops on Princess Gwendolyn and dreams of making it big as a stand-up comedian. Princess Gwendolyn believes in him, but when Nickerbacher shares his career preference with his father, he’s unceremoniously reminded of his place in life. Thankfully, Prince Happenstance comes to rescue Princess Gwendolyn and ends up setting Nickerbacher free as well. When the prince—whom Nickerbacher calls “Prince Fancypants”—encourages the dragon, noting that he seems “brave enough to do something about [his dream],” Nickerbacher decides to pursue his goal. He releases the princess and heads to the big city, where he soon makes his comedic debut. Barto, who also authored Gollywood, Here I Come!, has a knack for delivering giggles along with a positive message about being true to your heart. Nickerbacher’s humor will delight young readers, and his struggle to find his way in the world by going against the dragon-norm is a charming spin on a common motif. For Nickerbacher, pursuing his dreams proves to have a positive impact on his family, further cementing the moral of the story as a hopeful one. While the colorful illustrations from Kim Sponaugle are not a stylistic surprise, they still add sparkle to the delightful tale. Overall, Barto has delivered a fun, read-aloud worthy story deserving of a standing ovation.